Ukraine is embroiled in a bloody civil war. Both sides stand accused of collaborating with racists, of committing war crimes, of serving foreign interests. This proxy-war between Russia and the West was accompanied by a fierce information war. Ukraine in the Crossfire tackles the importance of ultranationalist violence during and after the EuroMaidan movement, and documents how many of these groups are heirs to former Nazi-collaborators. It shows how the Ukrainian state has seized on the ultranationalist war-rhetoric to serve its own agenda, clamping down on civil liberties on a scale unprecedented since Ukrainian independence. De Ploeg argues that Kiev itself has been the biggest obstacle to peace in Donbass, with multiple leaks suggesting that Washington is using its financial leverage to push a pro-war line in Ukraine. With the nation's eyes turned towards Russia, the EU and IMF have successfully pressured Ukraine into adopting far- reaching austerity programs, while oligarchic looting of state assets and massive tax-avoidance facilitated by western states continue unabated. De Ploeg documents the local roots of the Donbass rebellion, the overwhelming popularity of Crimea's secession, and shows that support for Ukraine's pro-western turn remains far from unanimous, with large swathes of Ukraine's Russophone population opting out of the political process. Nevertheless, De Ploeg argues, the pro-Westem and pro- Russian camps are often similar: neoliberal, authoritarian, nationalist and heavily dependent on foreign support. In a wider exploration of Russo-Western relations, he examines similarities between the contemporary Russian state and its NATO counterparts, showing how the two power blocs have collaborated in some of their worst violent excesses. A far cry from civil or ideological clashes, De Ploeg argues that the current tensions flow from NATO's military dominance and aggressive posture, both globally and within post-soviet space, where Russia seeks to defend the status-quo. 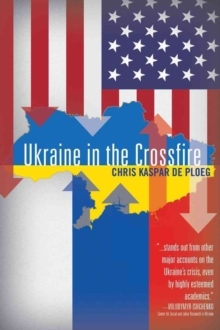 Packed with shocking facts, deftly moving from the local to the international, from the historical to the recent; De Ploeg connects the dots, consistently offering the necessary context for understanding the multiple faces of imperialism within Ukraine and beyond. Written in an accessible language, Ukraine in the Crossfire offers a truly comprehensive and independent narrative on the Ukrainian conflict.